"BFST® represents years of hard work improving the science of accelerated injury healing"
What is Blood Flow Stimulation Therapy®? One of the key ingredients to healing tissue is Blood Flow Stimulation. The Energy Web® that comes inside your BFST® Wrap does just that. By stimulating blood flow, the result is increased circulation to the injured area. Blood flow circulation is critical to recovery. The more often you can stimulate the blood flow, the more quickly you can heal. Being able to easily do this at home is key to a rapid and complete recovery. When Should Blood Flow Be Stimulated & Why Does It Help? Stimulating blood flow contributes to a healthy circulatory system. Blood flow works to improve cell growth and aids in proper functioning of the organs. Our blood contains oxygen and nutrients that are needed to help our body heal itself. When we're injured, blood flow to the area is usually significantly restricted. That's why promoting blood flow to the area of injury is so important. 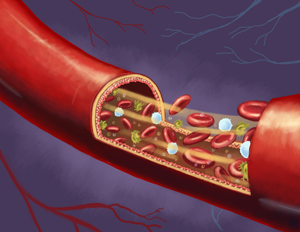 This is what opens up the blood vessels so the soft tissue can receive the oxygen and nutrients it needs to heal. Blood flow should not be stimulated until the inflammation and pain are gone from the affected area, because you want to restrict the blood vessels when you have pain and swelling, not open them up. Blood flow therapy works to speed up the healing process for tissue that's no longer painful or swollen. Our BFST® device acts in the same way that physical activity does when it comes to promoting blood flow. When you're physically active, your heart starts racing and your blood starts pumping. This helps contribute to faster healing of damaged tissue. With BFST®, you are getting a targeted blood flow treatment. The Electro Magnetic Energy goes deep down to the soft tissue, bringing additional blood flow to the injured area, accelerating the healing process. The benefit of BFST® over physical activity is that with BFST®, you're resting during the treatments. This means you're avoiding the potential for re-injury that comes with physical activity. We recommend 3-4 blood flow treatments per day. Each treatment is 20 minutes and the effects of each treatment last for up to 4 hours, so it's best to spread your treatments out over the day. Even once you feel healed, you should keep doing regular blood flow treatments in order to maintain your healing. Stimulate your blood flow prior to physical activity to help prevent re-injury. This acts as a warm up for your circulatory system. How Does Better Circulation Help Us Heal? Blood flow is directly tied to the health of your tissue. For example, the more you exercise a certain muscle in your body, the stronger it becomes and the more blood flow you're bringing to it. The same can also be said for your circulatory system. The more you work out your circulatory system, the healthier it will become and the more efficient it will be at delivering the nutrients your injury needs to heal. The BFST® device works by stimulating blood flow in the healing tissue. Stimulating blood flow following an injury involves a "give and take". The blood flow brings oxygen and nutrients to the injured area that are essential to the re-growth of your damaged tissues. The blood flow also carries away the waste by-products that are leftover from the time of injury. What is the BFST® Device & How Does it Work? The BFST® Wrap is a diathermic device that stimulates blood flow deep within the soft tissue, providing nutrient-rich, optimized blood flow to the area being treated. Diathermy is well recognized and accepted by the medical community as an effective means of promoting sub-dermal blood flow in order to speed up healing and recovery times. The BFST® device uses proprietary technology and is an advanced diathermic device over older technology like Ultrasound. For example, you would probably treat yourself with Ultrasound for 10-15 minutes at a power level of about 1W over a very small area. With the BFST® device you would be treating yourself for 20 minutes at a time, with about 10W of energy, using the unit over a much larger target area. That's 10x the power for a longer duration. And the treatments promote your blood flow for a longer period after your treatment ends. BFST® is also much safer than Ultrasound (as there is no risk of small, localized sub-dermal tissue damage) and does not interfere with implanted medical devices like Microwave and Shortwave devices do. It's really just newer technology that we feel does a much better job. The Energy Web® inside the BFST® device produces Electro-Magnetic Energy (EMR) well below the more dangerous visible light frequencies, (within the ultra-safe bands of the EMR spectrum at very safe power levels), at a frequency that is far above the highly magnetic frequencies like Shortwave. We feel our technology is superior to Shortwave, Ultrasound, Microwave and IR LED. People often ask us for information beyond this, but that information is proprietary because we don't want our technology to be reproduced. Our BFST® Wraps are FDA Registered medical devices. They have also passed the Health Canada and IEC 60601-1 3rd Edition approval processes. We are audited on a yearly basis to ensure the legitimacy of our product as a medical device. EMR (or Electro Magnetic Energy) is energy that travels through space. There are various types of EMR, like radio waves, microwave and visible light. Different types of EMR can travel through different surfaces. While BFST® can travel through your skin and fat to your soft tissue, it can't penetrate bone. Some types of EMR are safer than others. For example, X-rays are a more dangerous type of EMR, while BFST® is not. On the other hand, MRIs are similarly safe to BFST®. While you should limit your exposure to X-rays, an MRI is not harmful, even for extremely long period of exposure. The BFST® device uses specially controlled and incredibly safe levels of EMR. This EMR is absorbed by your blood and soft tissue, and used to stimulate additional blood flow. Our BFST® technology tries to limit surface heating as much as possible in order to avoid blood pooling on the surface of your skin. When blood pools at the surface of your skin, the EMR is blocked by your pooling blood, diminishing the effectiveness of your treatment. Because the BFST® device is designed to limit surface heat, the EMR will penetrate deeper and blood flow will be promoted more effectively. BFST® Wrap vs. a Heating Pad? 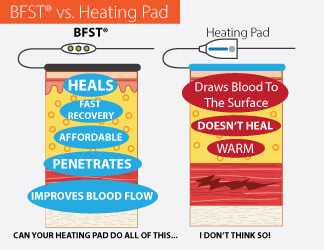 Typical heating pads are very different from BFST® technology. A typical heating pad will draw blood to the surface of the skin and make it warm or hot to the touch. It is NOT designed to increase blood flow below the skin and into the tissue to heal. Remember, a typical heating pad is a consumer good used to heat things, not heal them. 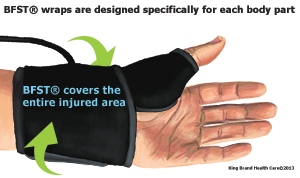 The King Brand® BFST® Wrap is an FDA Approved Medical Device designed to heal more than heat. There is a difference between feeling warmth and actually healing tissue. Our BFST® Wrap is the medical device that is intended to heal your tissue. How Does a BFST® Treatment Feel? BFST® treatments are not designed to produce a lot of surface heat. Only a very small amount of heat will come from the Energy Web® itself. Treatments are comfortable and relaxing. You will not feel any pulsing, vibrating, shocks or discomfort from a treatment. What you may feel during the treatment are the by-products of increased blood flow. Some customers report a slight tingling or warming sensation when this occurs. The more treatments you do, the more this will lessen. This is a good sign! It means that circulation in the injured area is improving. BFST® Is Not Just for Initial Healing - Prevent Re-Injury Too! Once your pain stops and mobility improves, do not stop doing BFST® treatments. While on the surface you are feeling better, in reality your tissue is only partially healed. Depending on the injury or condition, tissue can take many months to heal. By design, the BFST® will stimulate deep into your tissue to continue the complete healing you need to get back to normal. Not only can you continue the course of healing, you can maintain it and prevent re-injury by using the BFST®. Do a BFST® treatment before physical activity, as stimulating circulation before any physical activity will act as a "warm up" for the tissue. It has been shown: tissue that is warmed up is less likely to experience re-injury. And preventing re-injury is key to complete healing, as well as avoiding further pain, swelling and discomfort. Since each body part is shaped differently, every injury deserves a custom designed wrap and Energy Web® for the best possible treatment. 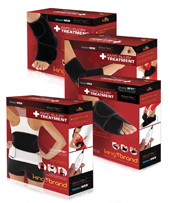 At King Brand® we have BFST® Wraps for the Foot, Ankle, Back, Elbow, Knee, Achilles, Shoulder, Wrist, Leg and Arm. This means you get a targeted treatment over the entire area of your injury, every single time, getting the most out of each and every treatment you do! The wrap itself molds the Energy Web® around the body part to perfectly cover the injured area. Some wraps are universal such as the Back, Leg and Large Body, and are easily positioned to treat a variety of locations on these body parts, including the hip. Our high quality fabric and Velcro® for securing the wrap means you get a great fit every time you use the BFST®. Can I Avoid Surgery Using the BFST®? All injuries are different, but in many cases surgery does not "repair" your damaged tissue, instead your tissue is cut away and removed! 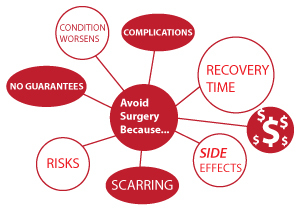 Surgery comes with many associated risks and should always be the last resort. And, there is never a 100% guarantee that surgery will work or heal the area completely. Over and over again we have heard from our customers that the King Brand® BFST® Wrap has healed their injuries and helped them avoid surgery. Resting comfortably at home or work while using our BFST® Wrap to heal your injury is a technology that is available to you! Often when an injury is at rest, blood can pool and/or have limited circulation, thereby creating pain and discomfort. What better way to prevent this than with a BFST® treatment! Healing while watching TV, at your desk, wherever you are at rest, is something you can do. Each BFST® treatment will increase blood flow to the injured area for up to 4 hours, helping you avoid pain and discomfort, and healing your injury. While physical activity increases blood flow, it can also lead to re-injury and a longer recovery time. If you want to accelerate the healing process, regular BFST® treatments are the answer. Every BFST® purchase comes with the additional benefit of having one of our helpful King Brand® Advisors contact you several days after your order has been delivered. We want to be sure you have received your order, know how to use the product(s), and answer any questions you may have. A lot of time and dedication is spent with each and every one of our Customer Care Advisors, training them to be of service to our customers. Knowledge of the King Brand® product line, as well as types of injuries, tissues, conditions and anatomy, are taught to our Advisors. They spend all day every day giving people treatment advice and guidance. Our Advisors truly care about your recovery. While one of our Advisors will follow-up with you directly, you are welcome to contact us any time. Your recovery is very important to us. Call us toll free now at 1-844-400-2525. Our Advisors will help you pick the right products and can develop a treatment plan for you. We're here to help you every step of the way. King Brand® ColdCure® and BFST® Wraps are FDA Registered medical devices. They have also passed the Health Canada, ISO 13485, ISO 10993 and IEC 60601-1 3rd Edition approval processes. ISO 10993 in particular is important when it comes to material safety. This standard ensures that our devices are made from 100% biocompatible materials. These materials are actually safer than those used to make most baby products, including toys, clothes and even diapers. These are not simple consumer goods. These devices are manufactured and tested to the highest safety standards in the industry. Note from KB WebMaster - The text below is primarily intended to assist with Google properly classifying this page content. To learn more about our products please visit our website.<br>BFST stands for Blood Flow Stimulation Therapy. BFST is designed to heal soft tissue injuries and chronic conditions. BFST stimulates blood flow in the area of your injury to heal your damaged tissues. BFST Wraps are specially designed for the body part you're treating. We have BFST Wraps for the knee, ankle, achilles, back, leg, elbow, shoulder, wrist, and foot. BFST Wraps are not heating pads. While heating pads only provide surface heat and have very little therapeutic value, BFST Wraps penetrate deep below the skin to promote blood flow in the area of your injury. This increase in blood flow creates an ideal environment for healing. The difference between a heating pad and a BFST Wrap is huge. The BFST Wrap can also be worn between treatments to provide comfortable support and protection for your injury. Don't stop using BFST once you feel healed. Keep doing BFST treatments for months to maintain the healing you've done and prevent re-injury.